With nearly 400 stores across five countries, we're a one-stop source for domestic, international, and freight shipping services. When you visit your local Pak Mail in Doral, we'll find the most cost-effective, safe way to pack and ship your items, whether it's by air, ocean, or ground. Welcome to Pak Mail Doral! 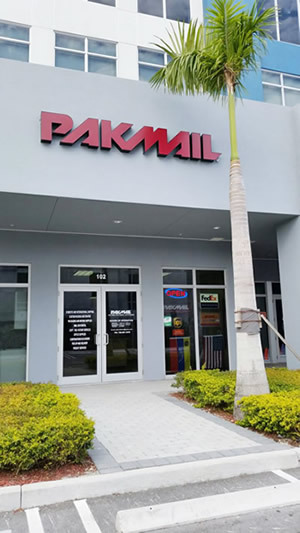 Pak Mail Doral is located in the heart of Doral at the Park Centre shopping mall behind Chick fil A and TD Bank on the ground floor. We are full service packing and shipping store as well as a custom crating and freight shipping company. We specialize in international and domestic shipping. Nothing is too big, awkward or fragile for us to pack and ship! We ship across the state, the US and around the world. We Pack and ship Industrial Antiques, Artwork, Oversized items and Anything fragile. We are specialized in small residential and office moves. We offer free pick ups on shipping orders! We could also be your personal packing and shipping department. Wether you need to ship or receive.